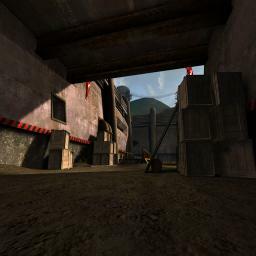 Really outstanding ctf map. There is alot of places to explore, the skybox is very nice, it really bring more life to the map. The flag rooms are half-life-ish. Really cool light effect with the windows and lightmap. Wich light map is it by the way? 16,8? reminded me a lot of a HL2 map, and that is a good thing. Its fun to play... the layout is complex, but easy enough to learn, and just fun to play. The map is superb looking. It is industrail, but it stands out from other industrail maps, and it impressed me even more than Redkin. This map is a piece of art. Looking forward to downloading this one when I get home. I assume this is a reinterpretation of UT99's CTF-Hydro. I loved that map and this looks like it's a worthy successor. All I can say is... OMFG!. Pure ownage. i337 mappage. This surpasses most, if not all retail maps (and 3rd party maps too) If TheSpoonDog isn't mapping professionally yet, all I can say is... WTF not?!. After an extensive exploration of this map (no botplay yet) I found almost nothing wrong and oh so much right. Most notably, the water in the center of the map is by far the most realistic depiction of rushing water I've yet seen in any map/game, UT2K4 or otherwise. Granted, I've only played a relatively small % of what's out there, but I can't imagine anyone doing better. I assume custom textures were used. Whatever the method, the result rocks. Keep up the great work SpoonDog! Perfect followup to CTF-Hydro32. Very outstanding map. I normally don't comment on maps or anything but this one is just too nice to not comment on. 2: You can go above the map via the sniper room (some pipes you teleport onto then there is a open vent to teleport through)...can't exactly get a flag carrier up there but I can see how campers would love it with LG. normally i dont do stuff like this.. but..
2 nitpickings though, the doors up high in the flagroom are bit.. to big, and the elevator textures lack detail. - The greenish light at the far end of the tunnels have no indication of a lightsource. - The lightsources inside the vent system are bleh realism-wise. Cool map and shows how to make a good remake instead of brainlessly copy pasting bsp, slapping in some meshes and making no changes to the original theme, floorplan or gameplay. Real remake and cool changes. Specially floorplan. 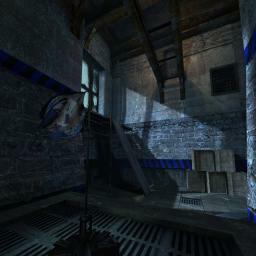 The light has great shadowstuff but the colors look uncoherent at times and lack enough highlights and smaller lights to create a lighting composition, its relying completely on its sharp shadowstuff that often leave big areas in 1 type of dark ambient light which is uninteresting to look at regardless of realism style. Eg the middle. The best CTF map to show up in ages! What Fordy says..... oh, nine. Truly a great piece of work. Had quite a bit of trouble finding my way around at first, and even still there's about a zillion ways to go so it's hard to keep track of things. I also didn't like how you can't dodge over to the 100a as a flag carrier. There are ladders right there that you can reach; why should we be unable to just climb up them? Eh well. Nuf said, I Love spoondogs' maps! This one shows why. Awesome! It has become my favourite big-sized CTF map! I like the layout, I played a couple of times and I haven't learnt all the connections and ways to attack/escape yet. The sniping position works well. Teamwork is required to win here. The bots are helpful enough. I really liked it. Great graphics and good layout. I liked the original UT version as well. 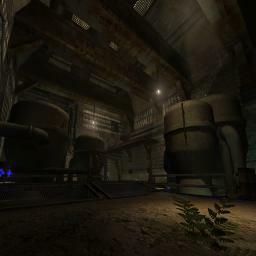 One of the best looking and most solid UT2K4 maps I've seen and played. And I don't even like CTF. One thing I would have liked to see, given the talents of this mapper, is a new water rapid texture - they look great nonetheless. I have not played a single 2k4 map that had a layout that was this diverse for a flag runner. It's fast paced, fun, challenging, and extremely competitive. For the competitive gamer, this ranks right up there with the best. I can't wait to see the League Edition version. >A very 1337 map. The sharp lighting reminded me of Half Life 2 lighting, some of the floor plan alludes to its predecessors but is still different, the water is some of the best iv'e seen, and about getting on top of the map through the screen, it looks like you ment for it to be like that. THIS IS A SUPERB MAP IN EVER RESPECT CANT FAULT IT A MUST HAVE.THIS IS A BENCH MARK FOR ALL MAPPERS.